There are varieties of cardiovascular machines out there, such as stationary bikes, treadmills, rowers, stair climbers and the almighty elliptical machine. In all, these machines do a wonderful job in helping people to lose weight, burn calories or stay fit. However, they are different choices that fit individuals or some individuals find one cardio machine appealing over another. And they have reasons for making a preference on one machine over the other. Elliptical machine, stair climber, and the treadmill could be categorized under the same family yet they have there unique effect on the body. And these machines could be seen lined up in most gym centers, offering varieties to its customers. And of course, they are also seen at homes making cardio workouts convenient and comfortable. There are very many benefits of the elliptical machine, which make it be different and outstanding compared to other cardio machines. And It will be worth mentioning that it is easy to use, as you grab the handles, stand on the pedal, and your legs in a gliding back and forth fashion. Aside from being easy to use, there are other benefits of the elliptical machine. In fitness, aerobic capacity is a very important aspect, because it enables users to do workouts in a longer period of time. That is to say, each session could be prolonged and thus you lose more calories. When you have a high aerobic capacity, you hardly run out of breath and so you will continue doing your thing (workout) without having a cause to stop. So, elliptical machine increases this aerobic capacity so that your heart rate is increased and you break a sweat as well. You can increase your aerobic fitness with this machine by engaging in 20 to 30 minutes a day workout, three or four days a week. People that suffer from certain joint and back pains could find the elliptical very useful. People with ligament tears, arthritis or osteoporosis problem can use the elliptical machine to exercise without having to make their condition worse. 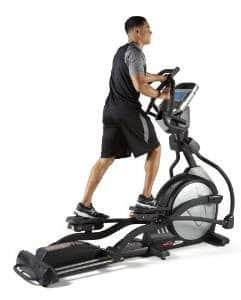 This is so because it (elliptical) does not place a lot of pressure or impact on the joints and bones thereby making the best option for people with joint and back pains. It is yet good for the elderly and persons recovering from knee injuries/surgery and obese people. When you are using the elliptical machine, you will be able to build all parts of the body evenly, that is to say, you can work the upper and the lower body at the same time. Unlike when you are doing a lot of jogging/running outdoors or using the treadmill, you tend to develop a lot of muscles on your lower body, such as the thighs and legs. The shoulders, back, chest, legs, and arms are worked on effectively with elliptical machine within a 20 minutes workout. With an elliptical machine, you may choose to concentrate on developing the lower body. There are people that would want to work to develop the legs. You can simply achieve this by placing your hands on the center handrail and just use your legs to move the pedals. And you can reverse the direction of the pedals in order to achieve a more intense effect. Harvard Health Publications have declared that you can burn up to 400 calories in just 30 minutes working out with an elliptical machine, depending on your weight. People that are heavy tend to burn more calories in this time frame. Also, the intensity of your workout impacts the number of calories you burn. Therefore, increase the resistance of the machine or the number of your training sessions in order to burn more calories. You will agree with me that the benefits of the elliptical machine are quite impressive. Therefore, if you are planning on using or getting one, you can always do so by going to Amazon where you will find the one that is within your budget. If you have any question, comment or contribution, do not hesitate to drop it at the comment box below. And do like and share if you find this article useful.